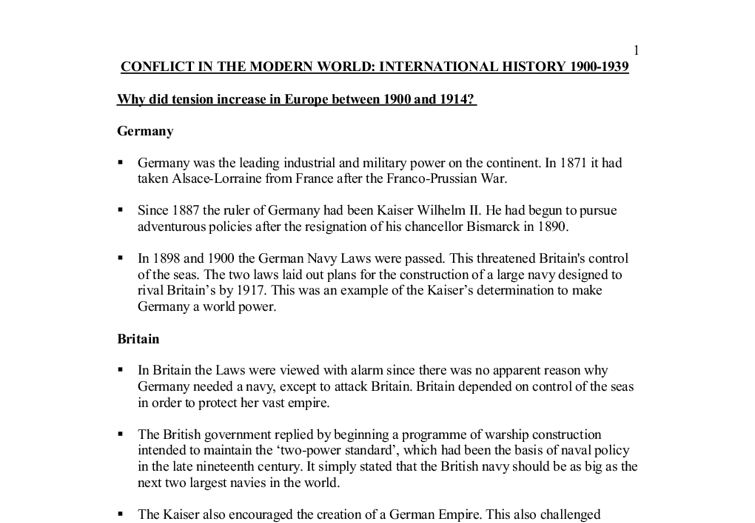 CONFLICT IN THE MODERN WORLD: INTERNATIONAL HISTORY 1900-1939 Why did tension increase in Europe between 1900 and 1914? Germany * Germany was the leading industrial and military power on the continent. In 1871 it had taken Alsace-Lorraine from France after the Franco-Prussian War. * Since 1887 the ruler of Germany had been Kaiser Wilhelm II. He had begun to pursue adventurous policies after the resignation of his chancellor Bismarck in 1890. * In 1898 and 1900 the German Navy Laws were passed. This threatened Britain's control of the seas. The two laws laid out plans for the construction of a large navy designed to rival Britain's by 1917. This was an example of the Kaiser's determination to make Germany a world power. Britain * In Britain the Laws were viewed with alarm since there was no apparent reason why Germany needed a navy, except to attack Britain. Britain depended on control of the seas in order to protect her vast empire. * The British government replied by beginning a programme of warship construction intended to maintain the 'two-power standard', which had been the basis of naval policy in the late nineteenth century. It simply stated that the British navy should be as big as the next two largest navies in the world. * The Kaiser also encouraged the creation of a German Empire. This also challenged Britain's dominant position. However, by 1914 there were only 5,000 German colonists, mostly in the least attractive parts of Africa, the Cameroons, South West Africa and Togoland. * In 1903 the Kaiser talked of a Berlin to Baghdad railway, which threatened Britain's position in the Middle East. Much of this was bravado, but it created tension between Britain and Germany. France * France was determined to recapture Alsace-Lorraine, which remained in German hands. * The French Army eventually created Plan 17, which involved a frontal attack on Germany from Champagne, in order to reoccupy the lost provinces. ...read more. * Hitler wanted to destroy the Treaty of Versailles, which he regarded as a humiliation for Germany. This would be one way of achieving his aim. * Hitler wanted to create a Greater Germany, which would include all German-speaking peoples. Austria was an obvious step. The first attempt at Anschluss took place in July 1934 * In February 1934, the chancellor of Austria, Engelbert Dollfuss, ordered attacks on the Austrian Socialist Party, which was then dissolved. From April 1934 Dollfuss began to rule as a dictator. * On 25 July Nazis entered the radio station in Vienna and forced the staff to announce that Dollfuss had resigned. They then entered the chancellery and shot and killed Dollfuss. The murderers were quickly arrested by the Austrian armed forces, and Italy and Yugoslavia moved forces to the Austrian border to prevent German intervention. 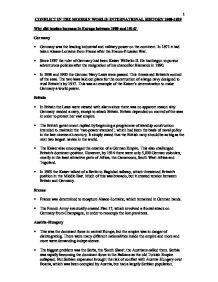 Between 1934 and 1938 relations between Austria and Germany deteriorated. In 1937, Mussolini also informed the new Austrian chancellor, Kurt Schussnigg, that Italy would not help Austria in the future. A second crisis over Anschluss developed in 1938 * February 12 - Schussnigg met Hitler and agreed to appoint some Nazi ministers to the Austrian Cabinet. Arthur Seyss-Inquart became Minister for the Interior. * March 1 - Unrest broke out in parts of Austria caused by Nazis. Soon the whole country was in chaos. * March 11 - Hitler sent an ultimatum demanding the resignation of Schussnigg. German troops were massed on the border. Schussnigg gave in and Seyss-Inquart became chancellor. * March 13 - Austria and Germany were united and April 10 a plebiscite was held which gave a 99.75 % majority in favour of Anschluss. Austria was immediately incorporated into the German Reich. The speed at which these events took place made reactions by Britain and France difficult. The two countries protested, but did little more. Why did appeasement fail to prevent the outbreak of war in 1939? Czechoslovakia 1938 The Anschluss meant that Germany now surrounded Czechoslovakia on three sides. ...read more. The Soviet Union was on the verge of financial collapse. * Gorbachev needed aid from the West, he knew that he would not get it if he ordered a clampdown on the East. The end of the Cold War The final talks between East and West took place in Malta in December 1989. By this time Reagan had been replaced by George Bush as president. Bush and Gorbachev announced that the Cold War was over. There was one last attempt to save the Soviet Union. * In August 1991 Communist hard-liners tried to overthrow Mikhail Gorbachev while he was on holiday in the Crimea. * Within three days the coup had failed. The Soviet army refused to back the coup. * The leading figure in the defeat of the Communists was Boris Yeltsin, the Russian president. * For the first time in seventy-two years the White, Blue and Red flag of Russia, outlawed under Communism, flew over the Kremlin. The Soviet Union no longer existed. The impact of the collapse on world affairs * The collapse of the Soviet Union not only brought an end to the Cold War, but it also produced much greater co-operation between the countries of East and West. * Within a matter of years, former members of the communist bloc were seeking admission to NATO and the European Union. * The United Nations Security Council began to work with much greater unity. * Communist regimes around the world collapsed for lack of support. Only Cuba and China managed to survive, but both were forced to look for economic support from the West, either industrial and financial or through increased tourism. * In Africa and South America, Soviet support for rebel groups disappeared overnight. * The division of the Soviet Union into separate republics led to an increased threat of nuclear accidents, as nuclear weapons fell into the hands of the Ukraine and Belorussia. * Inside the Russian federation, separatist movements developed in autonomous regions such as Chechnya. This led to increased instability in Russia itself. 1 ...read more. Italy invaded Abyssinia with a far superior army equipped with the latest arsenal whereas the Abyssinians had only limited resources. Stalin rejected the idea at the time because he did not want to get involved in a situation, which would provoke USA and South Korea into a war. By September 1949, Stalin was beginning to consider an invasion of South Korea. expansionism and that the Dutch should allow free rights of worship to Catholics19.The Dutch refused the conditions thus hostilities commenced. What this information shows is that Spain in much the same way as Sweden was motivated to intervene based on a perceived threat to Spanish political, religious and economic interests. Why did Britain and France pursue a policy of appeasement? Was it successful? In 1938 Hitler invaded Austria, but Britain and France did not see any reason to go to war over this, they underestimated Hitler, believing he just wanted to unite German speaking people. There was also a plebiscite in Austria and 99% of people voted in favour of Austria becoming part of Germany. that the families were not paid rent, they received only wages for their labour. They had to surrender the title to their land, their equipment and their animals to the co-operatives. Thusly in 1956, 95% of the three hundred million peasants were landless again. Why Was The Great War Not Over By Christmas 1914? Consequently the British Expeditionary Force (BEF) was sent out. As mentioned, there were many reasons for the First World War to break out, however all of the powers involved expected the war to be a relatively short one, probably to be over by Christmas 1914. However, it was not to be so. In the process Nagy was caught and executed, and the more staunchly communist Gomulka was placed in charge of Hungary. This authoritarian reaction by the Soviets showed the West that despite their new foreign policy, they would not allow their control over the communist bloc to be threatened, and this action worsened relations between the superpowers.